Here’s the front cover of the Daily Mirror. A haunting image of a starving British child, crying their eyes out. An excellent photo, taken by the excellent Lauren Rosenbaum in November 2009, shared on a US website (Flickr), sold by an American photo agency (Getty Images), used to illustrate poverty in Britain. Does it matter that the photo is not really a starving child? Does it matter that the photo wasn’t even taken in the UK? Is there an ethical issue in buying a stock photo of a child – not in poverty – and using it to illustrate poverty? Does it matter that the headline begins “Britain, 2014”, but the photo is actually “USA, 2009”? I’m not sure on the answers to any of the above, but interesting to think about. I don’t think there is a problem with this picture. I think a stock image is better in this case than an identifiable British child. The emotion in the image probably wouldn’t be the same if the face was obscured by pixels. I think it is more interesting to wonder why 330,000 children in Britain needed food parcels. Yes it probably is. But it’s a completely different question. The blog post is about an important question of media ethics. It’s a perfectly reasonable discussion point that does nothing to belittle the underlying story. Personally, as a professional journalists who specialises in the use of video to illustrate BBC news stories, this would be beyond the pale for us. I don’t think the subject matter or location the image was taken are that important, in this and most media stories instances. It’s a visual draw the the story itself and I’m sure, somewhere in tiny print there is a credit to Getty Images, much like every other photo used. The whole point of Stock photographs is they are versatile and can be used for a variety of purposes, quickly. Should a story be held up while a photographer is sent out to find a parent of a starving child willing to allow said child to be photographed, consent forms signed, contracts drawn up, money paid and then no doubt accusations of exploitation of misery made? Probably not if you can find an image from somewhere like Getty with a few clicks of a mouse. That’s just my thought on it. This is the Mirror we’re talking about and they are “selling” this story as one of a British child who is impoverished. If they are doing a story about a million food parcels, why not show a photo of a food parcel, or even a real person receiving a real food parcel? Bet they’d have trouble finding one. I don’t think it diminishes the story. It is an eye-catching and powerful image but it illustrates a much more powerful message. It’s natural to assume the child is one living in poverty in the UK, whose family is in receipt of assistance from a foodbank. The Mirror should, even if in the ‘small print,’ make clear the picture is a stock image. As readers are entitled to think the picture is directly related to the story they are are entitled to feel ‘duped’, but only by the visual image. 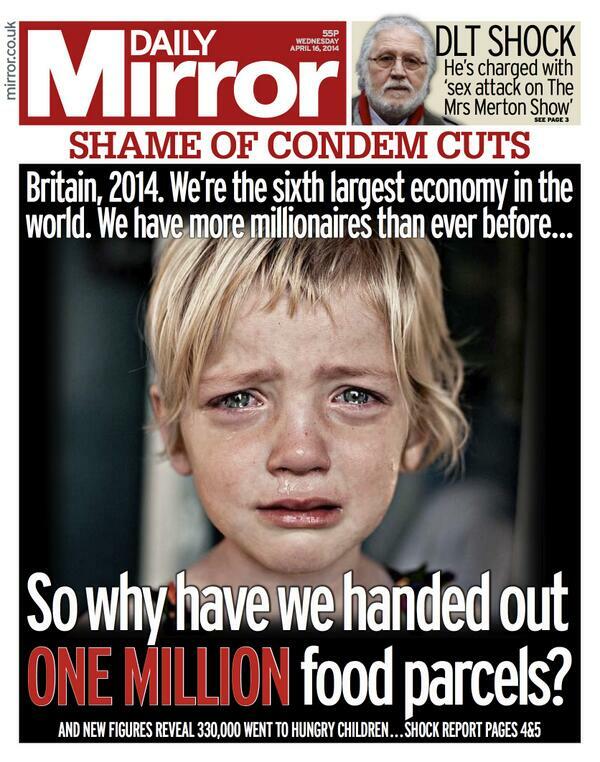 Sadly the Mirror has opened the door to those wishing to undermine the central facts of the story, related to the need for foodbanks in one of the world’s richest countries, by using a picture that doesn’t actually portray those facts. This is a non-issue. It’s idiotic that it’s even being discussed, as the content of the story is now taking the backseat. You might want to add that they used an image of a white kid even though they know the majority in the stated position are third world immigrants. This is intentionally done because they want to build sympathy and they think that if the real people in this situation are portrayed that it won’t help their intent which is to increase handouts to these mostly ungrateful miscreants. zefal – Are you able to cite any report that confirms ‘the majority in the stated position are third world immigrants’? There is no mention in the Daily Mirror’s report of the nationality or immigration status of those in receipt of assistance from foodbanks. I think it does matter. It’s not the end of the world and it should not distract from the real story but it does undermine the Mirror’s credibility. Firstly, in an age of spin and fakery – especially through social networks – it is good for journalists to be straight. Secondly, they could have taken a real picture. Thirdly, this was a front page visual lead – the photo IS the big impact of the story, so the fact it is a stock photo undermines its authenticity. Fourthly, this is an emotive issue. The growth of food banks is not all about poverty. There is a real debate to be had around this issue. By manipulation the Mirror slightly undermines its case. I don’t think this is a huge ethical issue, but imagine if the Mail had done this about, say, immigration. Would people be annoyed? We live in an age when journalists have to fight for credibility from a sceptical public – this kind of technique doesn’t help. it doesn’t matter at all that this is a narrative photo. it’s far better to use a stock pic rather than stigmatise a child who really is in receipt of hand outs from a foodbank. the story is that despite the tory fanfares about the economic recovery, and the crap so loyally repeated in the mail and the express this is the r=eality of the uk today. “media ethics”…isn’t that an oxymoron? Foodbanks are a major crisis in the UK. The right will pounce on this misleading image as a way to direct attention. But make no mistake, The Mirror let them do this. They allowed their front page (and very important) story to be completely undermined. Congratulations on finding the source of this picture. When I wrote my mini review of the papers this morning (www.sub-scribe.co.uk), I assumed that the child was a model. i thought it was a boy and one deliberately chosen to look like the film image of Oliver Twist. I wouldn’t have been surprised if he had been holding out a bowl saying “please sir i want some more”. There was nothing on the front, page 2 or the hunger spread to indicate that the picture was model-posed (i also thought that it was a pretty harrowing pose to ask a child model to produce such tears). It could not have been a genuinely hungry child on his or her own as the picture would have had to be pixillated, which would not have served the Mirror’s purpose. I don’t think it matters at all that it is not a genuine picture of a hungry child or that she is American. What is absolutely wrong is to comb the internet and then use a family photograph like this. When it comes down to it, to seek to illustrate this story with a crying child was doomed to fail whichever route the Mirror took. It should have thought more carefully. The story here is that food banks are being used by a relatively small number of people as an emergency measure. 2/3rds use the food banks only once. Usually the cause is a delay in receiving benefits, which situation has improved from 5 years ago, and the transfer of emergency loan administration to local councils. Ultimately it matters very little if emergency cash is given to buy food or emergency food. It’s still food. The story is definitively not about children starving in Dickensian poverty. But the selection of this photograph is deliberately to suggest it is. The Daily Mirror are lying to their readers, and the propaganda is extraordinarily effective. Contemptible journalism. Absolutely disgraceful use of this photograph. Particularly if the “news” paper concerned did not give a correct attribution. However, just about what one might expect from them. They have previous form for this kind of thing.